This versatile new fork lift scale can be used for check-weighing and tracking applications and can store records as well as upload data in real-time to a computer network. This NTEP-certified scale is ideally suited for a wide range of check-weighing and tracking tasks. The scale mounts directly onto a fork carriage and features a wireless WI-FI indicator and controller that mounts directly in the cab. Alliance Scale, Inc. has introduced a versatile new fork lift scale that can be used for check-weighing and tracking applications and can store records as well as upload data in real-time to a computer network. The Alliance Rice Lake CLS-420 Fork Lift Scale mounts directly onto a fork carriage, has a 5,000 lbs. capacity and features a wireless WI-FI indicator and controller that mounts directly in the cab. Ideally suited for a wide range of check-weighing and tracking tasks, this NTEP-certified scale features a full numeric keypad for manual tare entry, 1MB memory, an RS232 port, and can log up to 10,000 records and upload data in real-time. 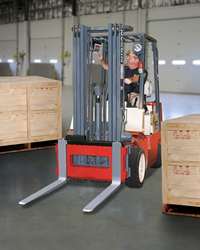 Designed for easy operation, the Alliance Rice Lake CLS-420 Fork Lift Scale has an accumulate weight function using the print key for multiple pallets, provides accurate shipment identifiers and weight-related data such as PRO number, employee ID, last transmission data, and estimated- and actual weight and skids. It is offered with a 9-36 VDC power supply for use on propane forklifts or a 10-60 VDC power supply for electric models. The Alliance Rice Lake CLS-420 Fork Lift Scale is priced from $6,900.00 up, depending upon instrumentation. Price quotes are available upon request.